The National Disaster Management Center (DMC) yesterday announced that more than 125,954 persons belonging to 32,136 families have been affected by the prevailing adverse weather condition in the country with 13 deaths reported so far. Around 43 houses have been completely damaged and 3225 houses have been partially damaged. According to DMC Deputy Director and Media Spokesman Pradeep Kodippili, people in flood risk areas have been evacuated to safe locations and to welfare centres. Approximately 13,832 families have been evacuated to 251 welfare centres due to flood and landslide risks in 10 Districts. However, the rainfall recorded was minimal in the major river catchment areas during the past 24 hours. Therefore, the flood levels will gradually recede. 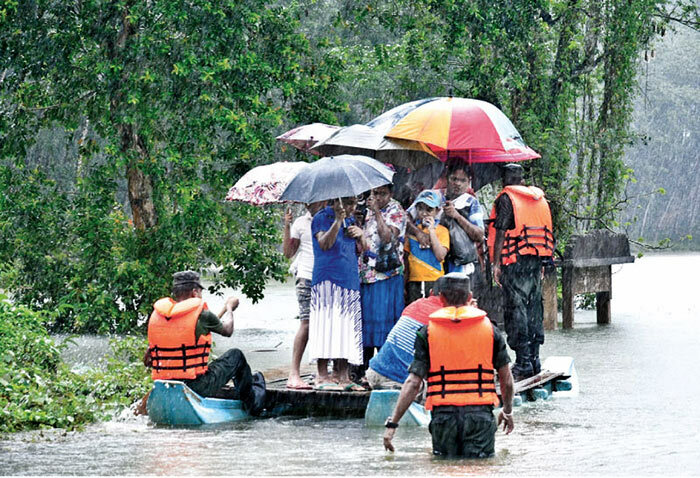 Disaster Management Minister Duminda Dissanayake said that measures have been taken to provide immediate relief to the persons affected by the bad weather. The National Disaster Relief Services Centre has provided Rs.24.9 million cash allocations to the 12 District Secretaries to address the immediate needs of the affected population. A meeting was held yesterday with the participation of the officials of the Ministries of Irrigation, Water Resources Management and Disaster Management, Military officers and District officials to discuss response measures to face any heavy flood situation in the coming few days. Full access to the Kaduwela main bridge towards Biyagama road has not been restored due to damage to the side-wall of the bridge. The bridge was closed from 10p.m. to 5a.m. However, repairs to the bridge are in progress. Access to the Panwila-Bambaraella road has been hindered due to a rock-fall in the Kandy district. The DMC is coordinating with Military agencies through its EOC for better response interventions and NDRSC is undertaking needs assessment at local levels, especially in safety centers. Meteorology Department Duty meteorologist Janaka Kumara said that the rainy weather condition prevailing in the South-Western part of the island is expected to continue and showers or thundershowers will occur at times in the Western, Southern, Sabaragamuwa, Central and North-Western Provinces. Showers or thundershowers will occur elsewhere, particularly after 2.00 p.m. Showers or thundershowers will occur in the Jaffna, Mannar and Mullaitivu districts in the morning too. Heavy rain falls of about 100-150 mm can be expected at some places in the Sabaragamuwa, Western, Central and North-Western Provinces and in the Galle and Matara districts. Fairly heavy falls, above 50 mm can be expected at some places in the Northern Province. There may be temporary localised strong winds during thundershowers. The General public have been requested to take adequate precautions to minimise damages caused by lightning activity. He further said that the windy and showery conditions are expected to further enhance in the Western and Southern sea areas and showers or thundershowers will occur at times in the sea areas around the island. Heavy showers can be expected at some places, particularly in the sea area extending from Kankasanturai to Matara via Mannar, Colombo and Galle. Winds will be Westerly to South-westerly in direction in the sea areas around the island and wind speed will be 30-40 kmph. The sea areas extending from Mannar to Pottuvil via Puttalam, Colombo, Galle and Hambantota can be rough or very rough at times as the wind speed can increase up to 60-70 kmph at times. Temporarily, very strong gusty winds (up to 70-80 kmph) and rough seas can be expected during thundershowers. The Naval and fishing communities are also requested to be vigilant. According to Irrigation Department sources, the water levels of Dunamale in the Aththanagalu Oya and Panadugama in the Nilwala River were rising. NBRO has still issued a landslide threat to Ratnapura, Kalutara, Badulla, Kegalle, Kandy, Matale, Nuwara-Eliya, Galle, Colombo and Kurunegala due to earthslips, cut failures and rock falls. The public are advised to move immediately away from the areas where they notice pre-landslide signs such as the development of cracks on the ground, deepened cracks and ground subsidence, slanting of trees, electrical posts, fences and telephone posts, cracks in the floors and walls of buildings which are built on slopes, sudden appearance of springs, emerging muddy water, and blockage or disappearance of existing springs. The NBRO warns people living in landslide prone areas to be extra vigilant and ready to move quickly to safe places if the need rises.